And the accusation is that it was a deliberate attempt to influence Durban Cop17 Climate Conference. …. and of course this is EXACTLY what it was. The real question should be, what is the motive..
ie Malaria is predicted to spread becase of AGW, by some, meaning more deaths in an indeterminate future… With the political capital and time (and relativelly small amounts of money) malaria could be erradicated in a few short years. And electricity to the billion and a half with out it, sanitisation, clean water, all the diseases of the poor, etc, etc could be eradicated. So the big question of the email leak comes down to motive..
Michael Mann appears to be trapped in his own thinking, as the ‘enemies’ he imagines are very much a USA centric construct (probably very true 15 or so years ago). But WORLD emission have gone up 40% in the last 20 years.. and it is not because of the WEST.. China and India, and all the developing countries have clearly chosen economic growth over AGW. And thus Kyoto fails, and any sucessor, as no developing country will cut any emissions, which in reality is energy production needed for growth. Leo Hickman of the Guardian has I think a very good initial article about Climategate 2.0, put together very quickly no doubt, and I think very balanced for the Guardian (far better than the BBC’s Richard Black initial reaction, who makes no mention of content), ie he picks out one of the key issues regading FOI, and mentions perhaps a non (‘evil’ motive) . Balanced enough to no doubt get criticism from everybody probably 😉 , so Leo is doing something right. illegal) but that instead his request merely prompted you to do a spring clean of various other emails that hadn’t been requested, as part of your regular routine of deleting old emails. legislation may prevent us from using such an efficient modern technology as email, but it seems that if we want to have confidential discussions then we may need to avoid it. It’s quite funny really, a very careful email that may be FOI’d itself reminding Phil that he meant ‘spring cleaning’ not deleteing (well that’s my perception of it). They really do not understand the spirit of this law – motive blind. Ben Pile of Climate Resistance, takes a look at the ‘Influence Durban’ question, and makes the contrast to all the ‘frightening message and scientific ‘press releases’ (full reports to follow much 😦 ) also no doubt designed to influence Durban. I’m sure much more will be said….. The best place to watch is probably Bishop Hill, Climate Audit and Watts Up With That and quite possible Dot Earth and even the Guardian. The Telegraph take should be interesting (Gray vs Delingpole, Lean vs Booker) and the Daily Mail as more information comes out.. But the abosulte majority of the public, politicians and even scientists will be oblivious to it, the real world has real pressing issues. Even if this event gives perversly Durban a spike of interest, the public/politicians, etc will still have moved on.. Both The Independent and The Telegraph write today about a Transparency International Report entitled – Global Corruption Report: Climate Change. Whilst corruption in Carbon Markets, Carbon Credits, windfarms scams, Solar power fraud and many other clever money making mechanisms, is not new news. It will be hard for governments and environmental groups to ignore this report. 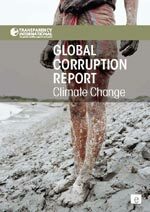 Not least when it spells out that many of the poor countries ‘affected by climate change’ are also amongst the most corrupt. Who needs fraud and corruption anyway to make money out of ‘climate change’? Wind farms operators were paid £900,000 by the National Grid to disconnect their turbines for one night because the electricity was not needed. Thus this story highlights the complete mess that the UK electricity infrastructure and UK Energy policy is in alongside the unsustainable amount of subsidies going to all those companies involved in the greenrush for renewables. I expect ever higher electricity bills in the UK may eventually focus the politicians thoughts on ALL the issues above. I haven’t stopped blogging, just been taking a break and have taken the time for a rethink. If It’s good enough for James Delingpole (three weeks R & R) following his Press complaints result, I thought time to take a step back and relax. Time to enjoy the Easter Holidays with my family, and despite all my least expectations spend a day enjoy watching the Royal Wedding. It helped having a very enthusiastic 6 year old daughter asking all sorts of questions. Real world intervening with blogging.. I will continue but at a slower pace and less comments elsewhere.